The last bit was a joke (I think) but the storm was real. For the next couple of hours, I lay abunk clutching my reisesykepose (sickbag) and feeling my chance of witnessing a celestial light show slipping away. But beyond some stomach-lurching tips and tumbles, the watery apocalypse never happened. The Finnmarken, a big, unflappable ship (well appointed, with pleasing Art Deco flourishes) was plying sheltered coastal waters. The rough passage out of Vardo set me thinking of those seafarers who ventured before us to this Arctic wilderness – in particular a Bristolian called Richard Chancellor who in 1553 set sail from Deptford, south London, in the Edward Bonaventure – at sixty tonnes, 260 times lighter than the 15,700-tonne Finnmarken – in search of a north-east sea passage to China. He got no further than Russia but on the way he found, mapped and named the northernmost point of mainland Europe: North Cape (Nordkapp). Jutting into the blank Barents Sea, and with a visitor centre attached, the North Cape headland is one of the excursions offered to passengers on the Hurtigruten fleet. These are the supply and passenger ships that have been the lifeblood of Norway’s remote coastal communities since 1893. Nowadays, thousands of passengers from all over the world come aboard for the ride. To appreciate the scale of the Hurtigruten operation, a grasp of the geography is essential. Unfeasibly long and thin, Norway is like a Scandinavian Chile. On its eastern landlocked side it borders Sweden, Finland and a sliver – a blin, you might say – of Russia. From Kirkenes, Hurtigruten’s northern terminus, to Oslo is 1,550 miles – halfway to Rome. At the line of latitude 66° 33’ north, just south of the port of Ørnes, the Hurtigruten ships cross the Arctic Circle. On a map, the coastline appears as finely fretted as a doily. In reality it is a maze of channels, inlets, islets and headlands, providing shelter for the ship and endless visual stimulus for deckbound passengers – provided there is enough light to see by. Come mid-November, when I sailed, the sun rises at about 8am and starts setting around 12:30pm. By 2:30pm, a ghostly gloom prevails, enhanced by the snow dusting the shorelines and the roofs of the ports of call. From now, the sun will not rise at all for two months. But there is a point in sailing now. Storm Force 11s notwithstanding, there is a decent chance of seeing the aurora borealis, especially in a winter when experts have predicted a peak in the solar activity upon which the frequency and quality of the Northern Lights depend. Each night I checked the ‘aurora forecast’ on Channel eight of the in-cabin television. A band of green-yellow light just touched the northernmost point of Finnmark – the Norwegian county that includes North Cape – indicating plenty of potential activity, but the cloud cover was such that on a scale of 0-9 the likelihood of actually seeing the Northern Lights was put at number one. Most passengers I spoke to had opted for the full north-south route, embarking at Bergen and getting off seven days later at Kirkenes, while stalwarts had gone for what you might call the Full Knut, Bergen back to Bergen, which takes twelve days. I hopped on for a three-night taster, from Tromso to Kirkenes and back, along the extreme northern perimeter that made such an impression on Chancellor. 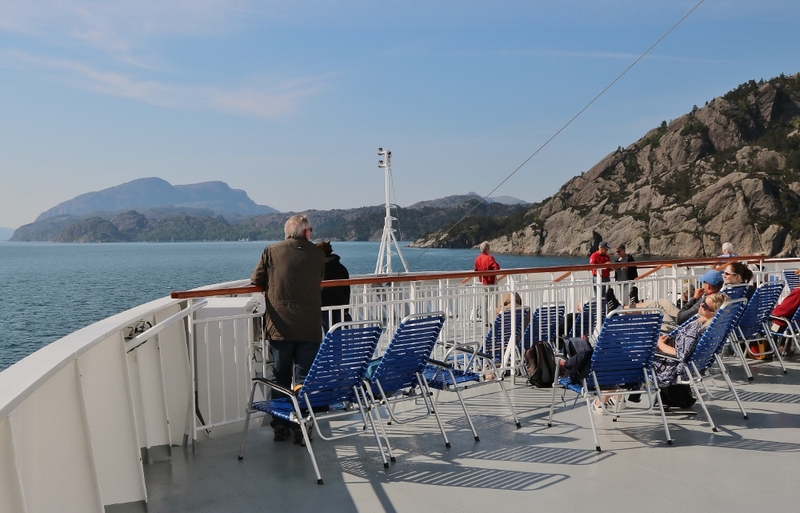 It could have been a bit of a lonely ride – Finnmarken has more than six hundred berths but only 50 passengers were booked for the northward haul from Tromsø. In the event, numbers were swelled by passengers from two other ships, the Richard With and the Nordlys, which were unable to sail due to “technical difficulties”. Some passengers saw the Northern Lights. Most didn’t. But at this dark and diminishing time of year there was light that was just as beautiful if not so spectacular. The morning light, for example. By about 10am the sun was as high as it would get – barely its own diameter above the horizon. But from this lowly position it can play many tricks, turning slanting banks of cloud into tangerine-coloured quilts, backlighting snow-dusted hillsides with peach-blush skies. At one memorable moment a single sunray spotlit a patch of cliff as if it were about to take a bow. Then there were the ports of call – eleven between Tromsø and Kirkenes, each visited twice – a reminder of the raison d’être of this maritime lifeline. From Honningsvåg we took a bus to North Cape, getting a feel for the treeless, snowbound wilderness that is Finnmark. But we didn’t have to get off to appreciate being in port. Viewed from the top deck, the ritual at each stop (some no more than fifteen minutes) was oddly mesmerising: a forklift truck would work like an ant on the quayside, unloading vital supplies from Finnmarken’s hold and ferrying them to a warehouse in its steel mandibles. Behind were the houses of this or that port – insulated boxes in colours of kelp-red, or ochre, or the shade of blue the sea turns at dusk. Like late-night jazz – a good description of the whole moody experience. A twelve-night Arctic cruise with Hurtigruten virtually guarantees a sighting of the Northern Lights – but if they don’t appear, you’ll be offered another free trip. That can’t be bad… The coastline of Norway is surely one of the most beautiful places on Earth, an ice-carved fairyland of filigree peaks, sheer-sided cliffs, glistening glaciers and tumbling waterfalls, all reflected in depthless fjords. The best way to see it is from the water, and one name is virtually synonymous with sea travel in the region: Hurtigruten. For almost 125 years the company has plied the 1,200-mile route from Bergen around the North Cape to Kirkenes near the Russian border, forming a lifeline to dozens of seafaring communities large and small. “Plied” is still the right word, because Hurtigruten’s fleet remains the major carrier of freight and people between many of the thirty four ports on its route. Every day a Hurtigruten ship sails from Bergen on the twelve-day round trip. Now they carry cruise passengers in full style and luxury, but there’s still the extra frisson of knowing you’re on a “real” journey to real places with real people, just as it was in the heyday of transatlantic liners or the Orient Express. Although summer is the most popular season, real connoisseurs will tell you that Arctic Norway’s winter profile can be just as beautiful – when mountains and forests are hushed by fresh-fallen snow, turned briefly to gold by the fleeting Arctic sunrise, and the lights of coastal villages are reflected in the fjords like glowing embers in the twilight. Most captivating of all are the Northern Lights, an iridescent panoply of neon-like light formations resembling anything from a silent firework display to a giant lava lamp. They’re only visible after dusk, so Norway’s long Arctic nights are the prime time to see them, and once you have, you’ll never forget. No one can predict when the Lights will appear – that’s part of their appeal. But when they do a Hurtigruten ship is about the best place to be. The sharp-eyed crew will alert you as soon as they spot anything, and then you’ll have a ring-side view, far from the light pollution of big towns and with the ship’s own lights deliberately kept to a minimum – unlike the “Blackpool Illuminations” approach seemingly favoured by some of the larger cruise lines. And you don’t have to worry about the expense of special excursions, or freezing toes in snowy fields, not when you have an attentive steward to hand and the prospect of a warm stateroom when the curtain falls. Twenty-two of Hurtigruten’s ports of call are within the Arctic Circle, where the Lights are strongest, and you stand a good chance of seeing them several times. In fact, the chances are so good that if they don’t show at all during a full, twelve-day cruise between October and March, Hurtigruten will give you a free six or seven-day cruise in recompense. As far as we know, there isn’t another cruise operator that does this. When the Lights are out, Hurtigruten can find plenty else for you to enjoy. The company’s onboard expedition teams have an unsurpassed knowledge of the region and throughout the year they organise more than 90 different excursions that will help you experience Norway like a local. Sample northern Norway’s fresh Arctic seafood, with cod, char, salmon, scallops and king crab all in season, along with moose, grouse and reindeer. Hurtigruten’s fine dining experience, Norway’s Coastal Kitchen, ensures you get the widest possible choice, with fresh, farm-to-fork local cuisine and menus changing every day. If you don’t have time for the full, twelve-day round trip (Hurtigruten’s Classic Round Voyage) the company also offers five, six and eight-day slices of the route. And with charter flights from a dozen UK airports, Hurtigruten also makes light of joining your ship. “This is sick,” shouted Edward, as our RIB speedboat scudded and thumped over the sea at 45mph. I was feeling genuinely queasy, but my eleven-year-old son was giving our high-adrenalin ride in the Lofoten archipelago the ultimate compliment in child-speak. And he was right: it was thrilling. Dressed in thermal overalls to insulate us from the Arctic elements, we darted in and out of rocky morasses looking for seabirds, and zipped along shorelines where slivers of white-sand beaches lay beneath jagged peaks.After a pit stop at an island fishing community for refreshments of salmon rolls and glasses of juice, we raced across the open sea back to the warmth and comfort of our ship, MS Nordkapp. My family was on a four-night journey with Hurtigruten, from Tromsø down the Norwegian coast to Bergen. Although we were travelling in the school summer holidays, Edward and his brother Arthur, fourteen, were among only twenty or so children on board. I wasn’t surprised. 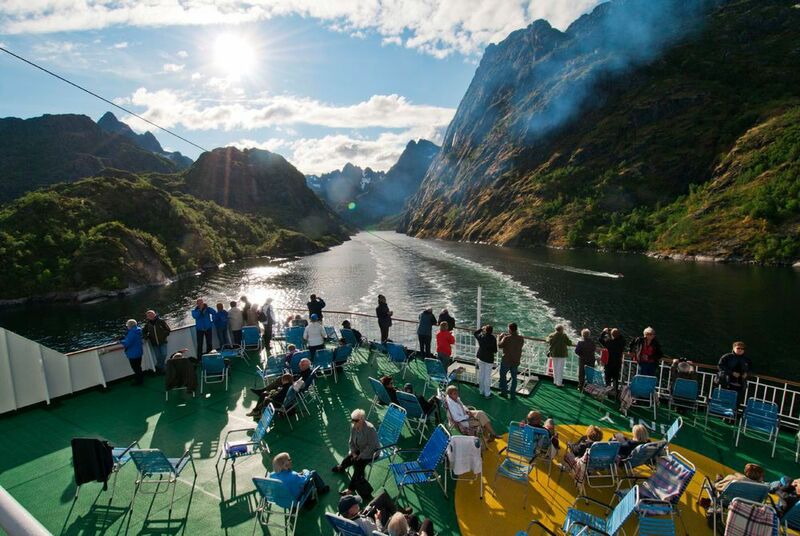 Hurtigruten bills its coastal trips as voyages, not cruises. While primarily used by tourists nowadays, the fleet also provides an essential ferry service for local passengers and cargo. Its ships are modest in size – Nordkapp can take 590 passengers – and they are civilised rather than ritzy affairs, devoid of the shows and kids’ clubs found on conventional, family-oriented cruises. Instead, the main entertainment is the spectacular scenery. With our route almost always in sight of land, we spent much of our time out on deck or in the main lounge with its wrap-around windows, taking in mesmerising views of spiky, snow-capped mountains above a glassy sea, and, further south, of idyllic-looking shoreside settlements with ochre huts and little jetties. When the boys tired of the scenery (which at times they did), we played cards, went for a soak in the open-air hot tubs and ordered home-made cloudberry ice-cream in the cosy, Scandi-chic café. Our full-board package covered dining in the main restaurant only and the food was largely a success. Most meals were buffets, with classic Norwegian dishes to the fore: salmon and cod served in lots of different ways and – less of a hit with the boys – marinated herring and brunost (a sweet brown cheese). Each day, crew members laid on cultural presentations about the current destination. None were aimed at children (although this year some ships have introduced the Young Explorers’ Programme – see below), and some offerings, such as lectures on Ibsen and Grieg, were too highbrow for me during a holiday, let alone the boys. But we enjoyed folk dancing on deck, and the jovial crossing the Arctic Circle ceremony. As the ship passed a globe on a rocky islet marking the latitudinal line, we all downed a spoonful of yukky but health-giving cod liver oil (a daily staple for many Norwegian children), and as a reward were able to keep the commemorative spoons. Our ship made fairly frequent stops at ports of call along the coast to let passengers on and off and load and unload cargo. At fishing hamlets we were often moored for just 30 minutes, with time only for a quick stroll and to check the eye-poppingly high prices in the supermarkets. In Trondheim, Norway’s third largest city, we had a few hours to explore and went on a self-guided tour before breakfast – much to the boys’ dismay. Most of the organised excursions we took were far more rewarding. The RIB adventure got top billing from the boys, but the sea-eagle safari was a hit, too. Just north of the Lofoten Islands we transferred to a basic small craft for sightseeing. Birds of prey were soon swooping down on their vast wings from the lofty cliffs to pluck fish from the water. We then entered the famous Trollfjord, our craft dwarfed by towering rock faces in the narrow, mile-long, cul-de-sac channel. Further south, we made a long but worthwhile boat trip out to the remote Vega archipelago, a multitude of low-lying islands, islets and skerries on Unesco’s World Heritage List. At Nes, a picturesque fishing village on Vega, the main island, we learnt about the painstaking process of eiderdown cultivation – carried out since Viking times – and about how A-framed huts are built to lure wild ducks to lay their eggs. 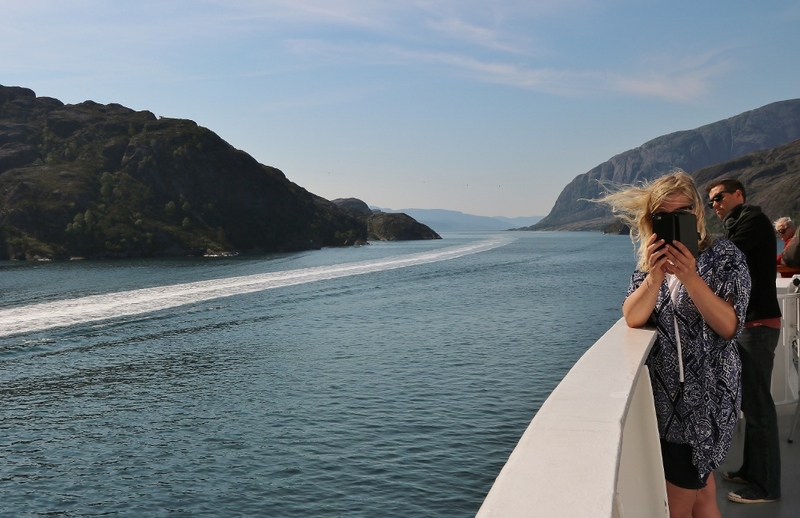 A Hurtigruten coastal voyage isn’t going to suit every family. For the most part, ours was a sedate experience and a grown-up atmosphere prevailed on board. But that suited us just fine, as did the short duration. Our boys would have grown restless on the complete coastal journey between Bergen and Kirkenes. As a contrast to life at sea, add a few nights to the end of your trip in Bergen, a lively and family-friendly place to stay. Take the funicular and cable car up to mountain hiking areas for superb views of this beautiful city.